There are two sides to every story, even if the story is limited to six words. Despite sparse tornados earlier this week, voters in Wisconsin, Maryland and Washington, D.C. still managed to schlep out to the voting booths and elect Mitt Romney in respective Republican primaries. Primed by vast experience playing jokes on celebrities and roles in Two and a Half Men and Dude Where’s My Car?, Kutcher was named as the clear choice to portray Steve Jobs in a forthcoming biopic of the Apple guru. Like its headlines, this week’s Six-Word-Memoirs vary in solemnity. These authors may remark on physical or emotional difficulties, but they each manage to maintain a tone of levity and witticism. To paraphrase the cowboy in Muholland Drive, attitude goes a long way. Whatever you’re doing, take a minute to step back and laugh at yourself a little. See? It’s at least kind of funny, right? Best Holiday Blessing: “May the family dynamics pass over.” - BetsyJo from Six-Word Memoirs on Jewish Life. Best Wordplay: “I can be such an idiom.” - Bevvi, with the most commented memoir of the week. Plus: Just a few days left to share your Six-Word Memoir on Your Money Life for a chance to win a copy of Jean Chatzky’s book Money Rules. 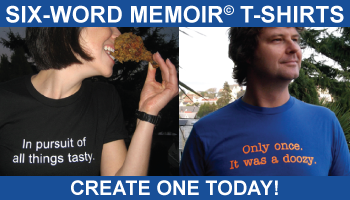 Click here for more information on how to submit memoirs. Contest ends April 9, 5pm est. Kudos to all! Great sixes as usual.